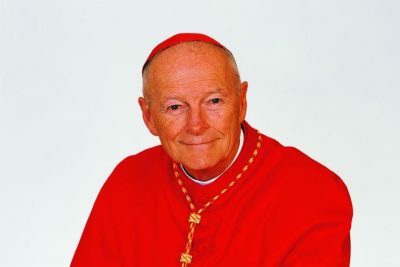 Former Cardinal Theodore McCarrick, who has been defrocked for abuse. The Vatican has defrocked the retired Archbishop of Washington after the Church found him guilty of the sexual abuse of children and vulnerable adults. Once the most powerful figures in the American Church, 88-year-old former cardinal Theodore McCarrick is the most senior cleric to have been defrocked in the modern history of the Church. The announcement yesterday comes a week before a major Church meeting on the Protection of Minors takes place in the Vatican. The statement said that the Congresso “imposed on him the penalty of dismissal from the clerical state” on 11th January 2019. McCarrick appealed the decision to the Ordinary Session of the Congregation of the Doctrine of the Faith, but at its meeting on Wednesday 13th February it upheld the ruling. “The Holy Father has recognised the definitive nature of this decision made in accordance with law, rendering it a res iudicata (ie, admitting of no further recourse),” the statement concluded. The Vatican was first notified of accusations against the former cardinal in September 2017, when allegations concerning the abuse of a teenager were reported to the Holy See by the Archdiocese of New York. Pope Francis ordered an in-depth investigation by the New York Archdiocesan Review Board and, in June last year, it found the allegations both “credible and substantiated”. At that stage, McCarrick was instructed that he was no longer allowed to publicly exercise his priestly ministry. On the day that instruction was given, the Diocese of Metuchen and the Archdiocese of Newark, in New Jersey, revealed that they were aware of past allegations of sexual misconduct by McCarrick, including two that the Vatican now admits had resulted in legal settlements – meaning McCarrick had been allowed to remain in office despite Church officials knowing he was guilty of abuse. In the course of last year, further allegations of misconduct by McCarrick came to light and accusations were published by American news media claiming that the cardinal had abused minors and adult seminarians. One victim revealed he had suffered years of sexual abuse by McCarrick from the age of 11. At the end of July 2018, Pope Francis accepted McCarrick’s resignation from the College of Cardinals and ordered his suspension from the exercise of any public ministry. A Vatican statement published at that time revealed that the disgraced American Church leader was effectively placed under arrest by the Pope with an “obligation to remain in a house, yet to be indicated to him, for a life of prayer and penance until the accusations made against him are examined in a regular canonical trial”. Up till this weekend, the former cardinal was resident at a Capuchin friary, St. Fidelis Friary in Victoria, Kansas in the Diocese of Salina. Now that the elderly former cardinal is no longer a member of the clergy, it remains to be seen if McCarrick will be subject to an investigation and conviction by civil authorities in the United States. A statement issued by his former Archdiocese reads: “The imposition on former Archbishop Theodore E. McCarrick of the penalty of his dismissal from the clerical state, thus prohibiting him any type of priestly ministry, underscores the gravity of his actions. Cardinal Daniel DiNardo, president of the United States Conference of Catholic Bishops said that the Vatican ruling shows that “no bishop, no matter how influential, is above the law of the Church”.